I have a very odd hobby. I enjoy putting lots of equipment in a rucksack and going up and down hills. Over time, friends have come to the conclusion that this either makes me a masochist or a hiker. I have yet to decide which term is the most accurate, although it is my belief that they think that it is the former. Hiking for me is a triumph of spirit over adversity. Or, if I have been drinking whisky, spirits over adversity. The main reason for this is that over they years I have had a series of operations on my left ankle (the last on Wednesday 13th May 1998) which has left it in a rather weakened state. I have just finished my 6,266.5 mile walk around the coastline of Britain to raise money for the Riding for the Disabled Association. I started this walk on October 1st in Edinburgh, and finished on the 27th September 2003. Below is a map showing all the walks that I have done since the beginning of 1999. You can also see an animated GIF of my walks Here. Since the beginning of 1999 I have been keeping a detailed log of all the walks that I have done. Below is a list of all these walks, along with notes, directions, photos and other details. Hence I have walked a total of 18350 miles in 1039 walks. Alternatively, see the walks on a county-by-county basis, or look at the map of all my walks. There is also a list of all the walks in relation to the OS maps that each walk needs, and also a calendar-based table showing the dates on which I have walked. Alternatively, have a look at a list of all the National Trails that I have walked. Having just finished a 6,200+ mile walk, I am taking it easy for a while and am planning no immediate long-distance walks. 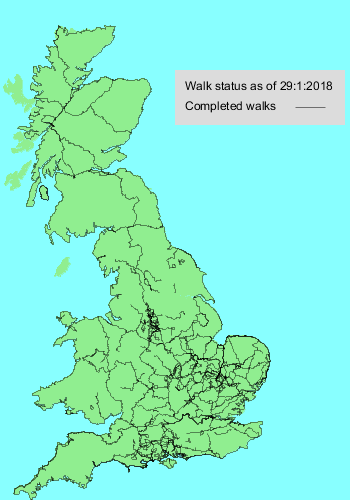 I have a hankering to do the Wolds Way and the Cleveland Way in a two-week walk sometime in 2004, and I also would like to complete a few more walks to the highest points of every county on the mainland UK. I would also like to do a long-distance path in Scotland over the summer; the Southern Upland Way appears to be tempting, but I may change thisplan later on. Look at my list of all the hiking equipment that I currently use. Will Self is quoted as having said in the Independant Magazine " I've taken to long-distance walking as a means of dissolving the mechanised matrix which compresses the space-time continuum, and decouples humans from physical geography ". Which I think is a convoluted way of saying that that walking allows you to escape from the everyday strains of modern life and gets you back to nature. The links shown below are some relevant ones that I have picked up over time. I try and make sure that they are all current, but if any are dead then please accept my appologies. A.Walker's Guide: Land's End to John o'Groats. Ramblers Association - Working for walkers to protect the British countryside.